Blood Bowl 2 is out in, blimey, two days, but there's just enough time for Cyanide and Focus Home to release one last trailer, dedicated to the fantasy American football game's many warring races. This time we see the snooty High Elves face off against the rather more down-to-earth Orcs, and as you can probably guess, it ends with the two races putting aside their differences to enjoy a steaming cup of Warhammer tea. No, wait, the other thing. Extreme violence. Lots and lots of Orcs and High Elves died in the course of this match, and I wouldn't have it any other way. 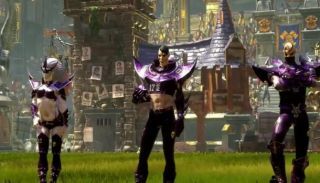 Blood Bowl 2's most recent videos introduced us to the Dark Elves, and those bloody Bretonnians, while we can also expect Dwarves and Skaven to put in an appearance. September 22 is the date to circle on your calendar, but the beta's already underway.